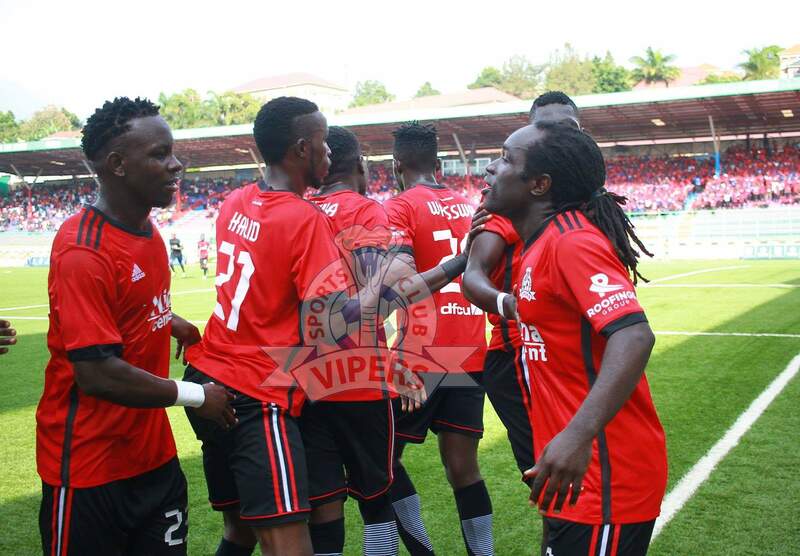 KITENDE – Geoffrey Wasswa scored an additional time winner as Vipers defeated Paidah Black Angels 2-1 at the St. Mary’s Stadium on Friday. On a day the Vipers wasted multiple goal scoring opportunities, they took the lead early in the second half via a Tito Okello penalty but Paidah replied instantly through Captain Cromwel Rwothomio. Vipers pressed from the on set but had to wait until the 9th minute for their first chance of the game when Tito Okello shot wide a Abraham Ndugwa cut-back. Moments later, Tito was at it again, this time heading Brian Kalumba’s well weighted cross, straight at John Kalumba in Paidah’s goal. Vipers kept on the front foot and thought they had taken the lead on 14 minutes but Joseph Janjali put the ball wide after beating Kalumba from just out side the area. Three minutes later, Geoffrey Wasswa curled a free kick goal wards but was tipped over for a corner by Kalumba. At the other end, Paidah saw their first opportunity via a free kick which was shot straight at Bashir Sekajka in the Venoms’goal. Tito who had been guilty of missing several chances in the early exchanges got another opportunity to give his side the lead but again failed as he headed Aggrey Madoi’s cross straight at Kalumba. The trend of wasting chances by the home side continued with 9 minutes of the first half to play with Wasswa the guilty party as he headed over Duncan Sseninde’s free-kick. On 44 minutes, Vipers saw a strong appeal for penalty waved away by referee Brain Nsubuga. Paidah was caught on the break and as Sseninde prepared to shoot, he was pulled back by Francis Otim but Nsubuga played on. Despite conceding a host of chances, Paidah held on to go into half time at 0-0. Like in the first half, Vipers started the second wasting chances and it was Tito again who blazed over a loose ball in Paidah’s area on 49 minutes. At the other end, Paidah who looked dangerous on the break saw striker Jackson Nsubuga fail to pounce on lazy marking by the Venoms, shooting straight at Sekajja. A minute to the hour mark, Vipers were awarded a penalty after Ndugwa was bandled over in the area. Tito who had missed a host of chances stepped up and slotted in from six yards to put the Venoms in the lead. In an attempt to see out the victory, Noah Wafula was introduce in place of Kalumba moments later. Paidah also made their first substitution, bringing on Patrick Arua in place of the ineffective Nsubuga. Janjali had a glorious opportunity to make it 2-0 for Javier Espinosa’s side but shot wide while unmarked in the area. Arua was in the thick of proceedings immediately, playing a long ball which was not dealt with by the Vipers’ backline and Rwothomio pounced, volleying in the equalizer which left Sekajja rooted at the spot. In response, Vipers made a second substitution, sending on Brian Nkubi to replace Ndugwa. With 10 minutes to play and still searching for the winner, Venoms’ top scorer Dan Sserunkuma came on for Janjali. Three minutes later, Sserunkuma could not add to his four already scored goals as he blazed over Sseninde’s well weight pass inside the area. As Paidah tried to see out the result, Floribert Pithua was brought on to replace the tired looking Charlie Adam. However, the day would belong to Vipers as they scored the winner in the second minute of the four added on. The day’s Captain Wasswa pounced onto a loose ball out side the area, drove through the Paidah defence and shot past Kalumba at the near post to send the home fans into a frenzy. The victory elevates Vipers onto top of the league with 18 points out of a possible 24. For Paidah, they now slip bottom of the log with only four points so far. The StarTimes Uganda Premier League continues on Saturday with unbeaten URA FC hosting Police at the Mandela National Stadium in Namboole.